Recently I went on an excursion with staff from Philharmonia UK, the London orchestra founded in 1945. 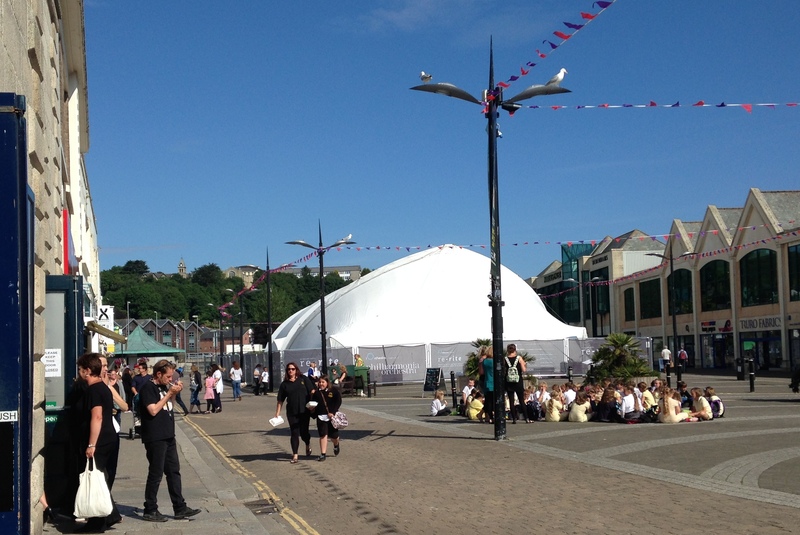 The Philharmonia was then in week twelve of its thirteen-week iOrchestra project that engaged residents of rural south-west England in large-scale digital installations created to encourage exploration of orchestral music in very new ways. The installations travelled in three regions, and in each of them, the Philharmonia also scheduled a free live orchestral concert. In the months preceding, Philharmonia sought out local music, education and civic leaders and organizations as collaborators. iOrchestra’s goals are not only to provide deep arts experiences in local communities, but also to help strengthen local networks of people engaged in community-building through music. The installations themselves were customized specifically for this summer’s project. 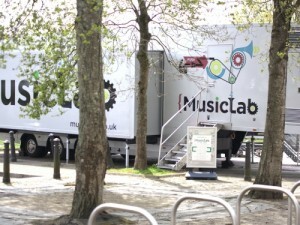 MusicLab is cleverly built into a shipping container and outfitted with hands-on learning activitie s for participants of all ages (mainly focusing on school groups and families with children). MusicLab’s multiple activity stations offer participants the experiences of composer, performer, producer, and conductor. 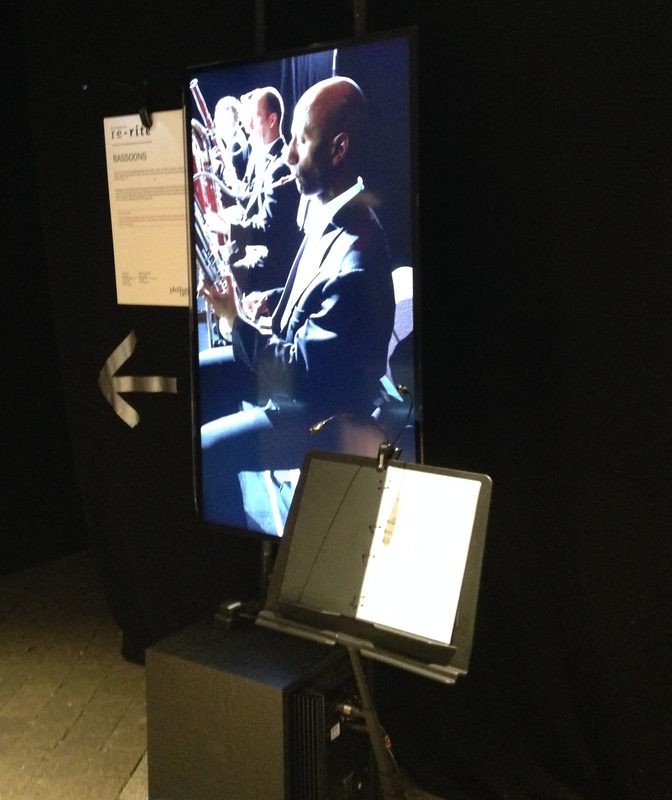 Visitors can record themselves singing tunes of increasing complexity, try one of four instruments while being coached through video exercises featuring Philharmonia players, watch and listen to video segments of films featuring orchestral music, and work in teams to create layered soundscapes based on samples of all the notes that specific orchestral instruments can produce. The day I visited MusicLab it sat on the edge of a very green park in Bodwin, Cornwall (population 14,700) and was full of a class of 30-odd boisterous elementary school children. They didn’t need help figuring out what the Lab elements were for, diving in to try everything with the energy children bring to new toys. Philharmonia education staff were ready to help if needed, and when the hour-long visit ended they led the group in a conversation about what was learned. Participants each got a location-sensitive badge to use when they returned; the badge gives information about how to log into the iOrchestra website to register and engage further. Those who register are eligible for prizes for further music experiences, and of course the data provided is helpful to the Philharmonia’s staff as they learn how participants use the digital tools and experiences. Many children come back multiple times after an initial school visit. The Lab is relocated every week or two, pulled by a semi-rig to a new village. While parked it’s open six days per week; admission is free. Philharmonia prepares for the Lab’s visits through outreach to community organizations, schools, and through traditional media, informed by a detailed audience engagement plan (it weighs in at over 100 pages). It’s well worth mentioning that all the Lab’s interfaces, exercises, and graphic elements are elegant, open-ended, and self-explanatory platforms for exploration and learning. Later that afternoon we traveled to Truro, a drive of about 30 minutes. Truro is a larger town. It’s the main shopping destination for Cornwall, and is home to a 19th century cathedral and charming downtown area where Cornish pasties, fish and chips, and fresh local ice cream are serious temptations. Smack in the middle of the town square Philharmonia had erected an enormous shapely tent and within it located a creation called “re-rite,” a media installation based on a video-captured studio performance of The Rite of Spring. Picture this. The white tent’s outer skin is taut and within it is a maze of large “rooms” separated by porous cloth “walls” that also are projection surfaces. It’s dark inside – blacked out. Each room is dedicated to a different instrument or instrument family – seven monitors and twenty separate projections in total. There are speakers everywhere. Once the installation is activated, the orchestra tunes up and the performance begins. Philharmonia players of each instrument family appear before you, projected larger-than-life within the distinct rooms. Wandering around the rooms, you can hear the entire orchestra, but the instruments you’re nearest are also the loudest, as though you are seated with that section. In front of each instrument family there’s a music stand (with light stands of course), several chairs, and the score for that instrument. Visitors can sit and listen, but also are encouraged to follow along with the score or even to bring their own instruments and play along (which people do). You also can don the tails set out next to the conductor’s podium and score, and conduct along with Esa Pekka Salonen, while watching yourself live on camera. Visitors also can watch the performance on two video monitors while listening through headphones, each with a talk track. In one, musicians comment in real time about what it is like to play the piece. “Just think of running 100 yards as hard as you can, and while you’re still short of breath, holding a teacup – that’s what this passage is like,” says one. “We follow Andy here,” says another. “We watch Andy and then we play. That’s what I’m doing.” In the other video, Esa Pekka Salonen offers his own talk track, describing what he is thinking and feeling while conducting the piece. “When I think of my conducting since I started more than 30 years ago, the trajectory has been really simple: I do less and less. It’s one of the problems with being a young conductor. You don’t really trust the players because you don’t quite trust yourself so you’re conducting too much,” he says at one point when his movements are constrained and much is being accomplished through eye contact. I was there for the Truro opening when Loic Rich, the town’s mayor, said this about the experience. “The Rite of Spring’s pagan orientation resonates here in Cornwall and as I saw the images, heard the music, and walked through the tent it reminded me of Stonehenge or Avebury. It seems so appropriately connected to our landscape.” Moragh Brooksbank, of the Arts Council England South West spoke next. “This project is dazzling in its scope and scale. We have an international orchestra working at the most local level. This exemplifies our goal of great art for everyone and shows how we can use digital to spread a love of the arts.” The Philharmonia offered free shuttle service in the region so people who needed transportation could experience re-rite. I’ll be writing more about the Philharmonia’s adventurous media efforts, how they’re imagined, structured, funded, and sustained. But in the meantime, check out the iOrchestra project on-line, follow the project @iOrchestraUK and if you can, go to a future installation and be the orchestra. Congratulations to Esa Pekka Salonen and the musicians of the Philharmonia for this intriguing work, and for their eagerness to create it. Can we experience these installations stateside soon, please? What a fantastic project! Thank you so much for sharing all the info about it. I am a Twin Cities-based independent consultant and writer working with cultural, philanthropic and public media organizations across the United States. You can read my entire bio on LinkedIn or read about current clients and projects on the Lutman & Associates web site.